In an essay for the booklet notes in this release titled ‘Cristian Carrara and the virtue of simple clarity’, Federico Capitoni writes about the composer’s decision to “win back this simple clarity which had been driven back under the wrong dictate of the avant-garde.” I know plenty of musicians who are old enough to remember the oppression of this ‘wrong dictate’, but they would have been pioneering by seeking simplicity in the 1960s and 1970s, not being born then. Even when I started mucking about writing music in the 1970s plenty of ground had already been won back from hard-core atonality, and indeed ribbed mercilessly under the Gerard Hoffnung banner in the early 1960s with pieces like Le Barbier de Darmstadt (Bruno-Heinz Jaja) and, after all, Michael Nyman’s In Re Don Giovanni was written in 1977. Things were no doubt different in Italy and I claim no expertise on that front, but with Carrara’s undated works probably originating no earlier than the 1990s or 2000s I think the argument for ‘winning back simple clarity’ is a bit redundant. I would also argue against seeing the avant-garde of the 20th century or any era for that matter as ‘wrong’. As with all things it had/has its origins, its reasons for existing, and its strengths and weaknesses. Dogmatism or militancy in favour of any kind of musical style or genre over another is to my mind the ‘wrong’ attitude. There is good and bad, strong and weak in all kinds of music. I have nothing against simplicity, romanticism and straightforwardly heartfelt personal emotion in music, and there is plenty of this in Cristian Carrara’s works here. If you were to listen ‘blind’ to this CD I suspect most innocent ears would be searching around trying to think of which film each might be from. This is nothing more or less than film music to my ears, and none the better or worse for that. It might not be the kind of film I would be that interested in seeing, but at least I might come away saying, ‘good score’, depending on which moments had been allowed into the final edit. The booklet notes are fairly helpful in pointing out the composers to which certain pieces are related. East West Romance for instance is a homage to Ennio Morricone with a sprinkling of Brahms. Carrara’s harmonies are rich if conventional, designed to support soaring lyrical lines which have a gorgeous feel, but which I would defy 99% of listeners to be able to hum back by the end. The orchestrations are effective but also endearingly corny, with thudding timpani and swooshing cymbals adding to the OTT cinematic effect. East West Romance is a photo of a sunset - and to complete the simile, a cliché forbidden by Magnum. Working backwards, A Peace Overture has some nice John Adams wind touches which alas stop all too soon. This aspect of the work refuses to develop organically, and its return as jolly syncopations here and there results in a strange stop-start feel to the piece. The booklet claims “it has a clear theme”, which I take to mean it has a nice tune: I struggled to define the clear theme. For further use of percussion see East West Romance; gawd. Tales from the Underground brings forth the names of Strauss and Vaughan Williams from the booklet, and a nice atmosphere is built for the first couple of minutes, after which we’re on a big high-plains drift with the feeling that the thing could go anywhere, which unfortunately it does, ending up nowhere. 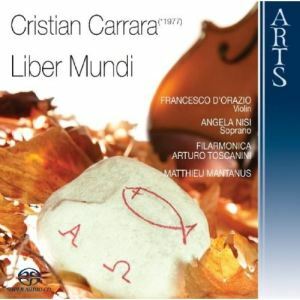 Liber Mundi for violin, soprano and orchestra starts promisingly, and if we’re looking for the simple clarity promised this is where Carrara delivers most. The soprano adds a poetic vocalise to the lyrical line above the gentle motion of the orchestra’s harmonies, and the whole thing has a fine sense of breadth and a rising, aspirational feel. Yes, it’s awfully derivative and probably about 6 minutes too long, but of the set it is something of a highlight. The rather nice Face to Face for string orchestra derives a marginally antique feel from its Biblical title source, but succulent textures soon bring us back to Hollywood. Think Gorecki’s Symphony of Sorrowful Songs in miniature for the opening section, after which chugging rhythms shift us for a time into other gears. The opening Mater is described as a prayer, and its ethereal atmosphere and tender gestures certainly suggest a spiritual expression. Arvo Pärt is cited as a related figure in this case, but I don’t hear this at all. If you like Keith Jarrett’s ‘classical’ album In the Light then this is the kind of thing which will probably float your boat all the way to Lemnos. Nicely recorded and effectively and warmly performed, the soloist and orchestra have a pretty easy time of it and no doubt enjoyed their sessions with Carrara’s music. This is the kind of music you can put on, safe in the knowledge it won’t distract you while reading a novel. It is not great art any more than a hot bath with sweetly aromatic bubbles is great art, but you just know the two will go very nicely together.